Having just finished watching Pan’s Labyrinth (although I know I shouldn’t be watching movies when I am in a foreign country), I am proud to be in the same country in which it was made. At times, it is brutally hard to watch, but fortunately I remember exactly where those parts are (because they still haunt me), so I know when to fast forward. The Spanish rarely do anything, but when they do, it is always art. Andalucians are especially lazy and beautiful. This is a result of the immense heat which I described earlier, combined with the pride the Spanish are known for. I appreciate flamenco because it achieves sensuality and elegance in a way that does not beg respect, but commands it. The food is both light and rich at the same time; even if you pay 2 euros for your tapa, it will still arrive at your table in an elegant arrangement and be of a higher quality that anywhere in the U.S. Their meals are famously long because the food is too rich to eat quickly. Occasionally there is a woman begging in the street. The way this is done is difficult to describe; she sits against the wall, bare feet tucked neatly beside her, face down and holding a sign. I will pass the same woman at 9 in the morning and again at 2 in the afternoon, and again at 8 in the evening. If there were a way to be both humble and proud while begging, that would be the way. Even the way Spaniards appreciate this “life-art” is different. It is achieved through seemingly blank and unabashed staring. Walking down the street, in the metro, etc., everyone stares at each other. If you make eye contact with them, you will not be greeted with the awkward smile you can expect from an American, but rather you will feel like you are having a staring contest with a goldfish. I suspect that people are merely curious about each other and the world and that this curiosity is not frowned upon, but it takes this American some getting used to. I am used to spying on people in secret. The Spanish pride is something they carry innately within them (like the Canadians). I have rarely seen an awkward-looking Spaniard. They all carry themselves well, are well-formed, and walk with confidence as if they are wading through molasses. I miss not feeling strange because I am laughing loudly in the street and tripping over something for no reason without being judged. The term should not be ugly American; it should be awkward American. That’s me. I have yet to see a Spaniard stumble. 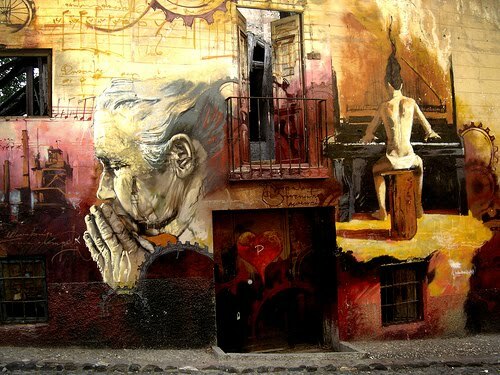 The Spanish take life slow because life is art. Americans forget that because they are their spilling too-weak-too-strong coffee on themselves.